Add speed and reliability to your mission-critical servers with a 64GB DDR4-2666 RDIMM Memory Kit (2 x 32) from Crucial. It's not uncommon for server resources to come under increasing demand. Whether it's more load from user access, or increasing the amount of active VMs, this kit of registered memory modules can alleviate that pressure. 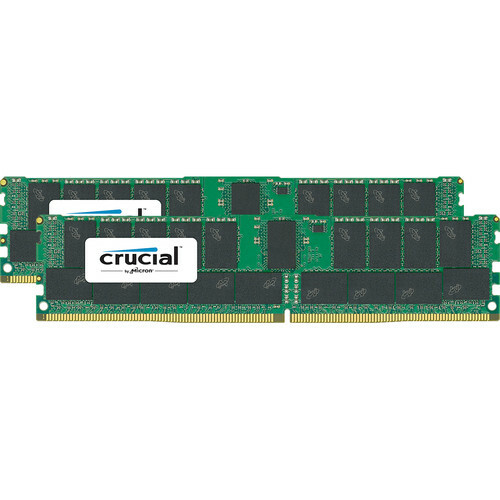 It provides your server with DDR4 level speeds that process data at a rate of 2666 MT/s. To help your servers reach their full potential, Crucial has worked with industry leaders in CPU and platform development, as well as server and motherboard manufacturing, in order to provide you with a stable and reliable product. To back this up, Crucial backs this memory kit with a limited lifetime warranty and access to the Crucial Reliance Program in select regions. Error-Correcting Code (ECC) to help provide increased data integrity and prevent data corruption. 8Gb-based density for improved performance and energy efficiency. Optimizations for Intel Xeon-based platforms. Compatible with OEM servers and warranties. Box Dimensions (LxWxH) 5.8 x 2.2 x 1.0"
Is this particular DDR-4 RAM compatible with the 2018 Mac Mini? This is 288 pin but I thought Mac mini needed 260 pin. The Crucial 64GB DDR4-2666 RDIMM Memory Kit (2 x 32) B&amp;H # CR2K32G4RFD4 is not compatible with a Mac Mini. At this time we do not have a compatible 64GB kit for the Mac Mini Late 2018 but it is available from OWC. The part number is OWC2666DDR4S64P. Is this compatible with the 2018 Dell XPS 9570?